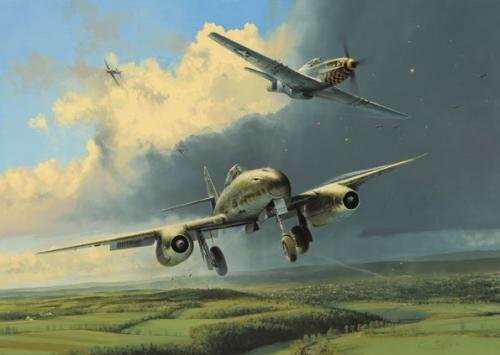 Running the Gauntlet, a superb painting by Robert Taylor, shows Me262s of JV44 returning to base in southern Germany, having come under attack from P-51 Mustangs of the 353rd Fighter Group. Almost out of fuel and ammunition, the Me262s have little option but to complete their landing sequence, hoping fervently they are not “bounced” by American fighters loitering in the area. They are out of luck on this occasion, and although Galland has organised a unit flying Focke-Wulf Fw190D-9s to provide air cover in the area of the airfield, they too have been caught by the 353rd Fighter Group’s surprise attack. At the relatively slow speed required on final approach, the Me262’s handling is sluggish and the pilot is having enough trouble without the attentions of a bunch of P-51 pilots. At this point the JV44 Me262 remains unscathed, and with the arrival of the Fw190s, there is the possibility this particular jet pilot will survive the day. THE ACES EDITION Joining artist Robert Taylor, each print has been individually signed in pencil by FOUR outstanding WWII fighter pilots. signed by an extra four fighter Aces.